While last year’s flooding in New England had area rivers at near-record highs, a pentathlon did so to heart rates this year. Hosted by Zoar Outdoor Center in late March, Charlemont, Mass.’s inaugural Berkshire Highlands Pentathlon was billed as a resounding success, taking racers on foot, snowshoes, skis, bicycle and paddlecraft over hill and dale. With the support of their Charlemont Economic Development Committee, Berkshire East Ski Resort, Zoar Outdoor and local volunteers, the five-stage event took place in the “betwixt” season (also known as “sugar season” or “mud season”) of late March, when there’s nothing else to do but torture yourself. Raising funds for The Franklin Land Trust and the Highland Communities Initiative, 120 hearty souls from as far away as North Carolina and New Jersey toed the muddied start line in the solo division and two-person and five-person categories. From there, they ran rugged trails for a mile ascent strait up to a “Sound of Music Field Descent” where they down-ran to to the sound of Eric Goodchild’s bagpipes. Next it was on more narrow paths to Zoar Outdoor’s headquarters, where they climbed onto road bicycles. After 9 miles climbing through Rowe, they descended to Monroe Bridge and pedaled another 10 miles along the upper Deerfield River. Bike leg complete, racers donned PFDs for five miles of kayaking to Historic Charlemont Center. Then came power-walking up the slopes of Berkshire East and then skiing through uphill and downhill gates to the finish below and, yes, more bagpipes. Times ranged from just under three hours to 4 ½ hours, wityh Josh Flanagan of Cohasset, Mass., winning for the men with a time of 2:59:52 and Lisa Grogan winning the solo women’s division at 3:27:44. Showing that it’s all about how your categorize yourself, Lessels finished first in the five-person-team-over-50 category with the West County Old Stars. Afterward, everyone congregated at Baker’s Oven Wood-fired Pizza and Berkshire Brewing Co. afterward. And yes, plans are underway for the event to continue in 2013. 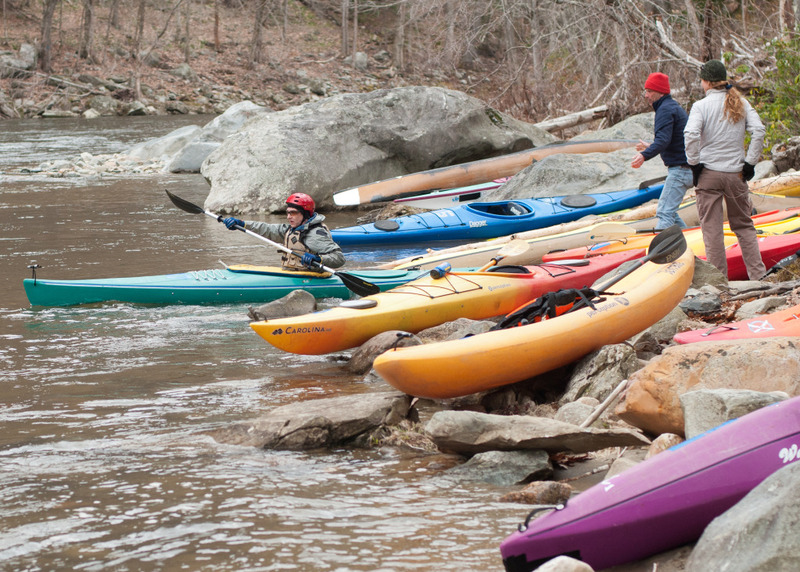 Note: The Deerfield River Rally will be held from May 19-20, complete with a River Cleanup, paddling refresher and the Reel Paddling Film Festival. Info: info@zoaroutdoor.com. Previous articleHungarian Man Becomes First to Canoe (yes, canoe) Single-handed Across the Atlantic.